It's time to strap in for some family-friendly snow day fun with Zordix's new title: Snow Moto Racing Freedom. An exciting arcade console racer with the advertised Zordix Interactive Snow Technology, a term I am pretty sure means, “How to make the snowmobiles leave tracks in the snow using the Unity engine.” I loaded up the main menu and went to my profile, where I chose Player Name, Nationality, Gender, and was given a broad palette of hues with which to paint my three color zones. I dialed in my settings and headed over to options to see just how pretty I could make it look. Graphics settings gave me a few options, including shadow quality, anti-aliasing, and terrain draw distance. I put all graphics to max settings. Noticeably missing from the settings menu are options for lighting effects, bloom, powder density, and other advanced graphic features. There is no tutorial, although I found the controls and stunt guide in the settings to be well laid-out. I used my X-Box controller after a very brief attempt at keyboard control. Like many racing titles, most players will want to use a controller to get the best experience, and Snow Moto Racing Freedom offers full controller support in Steam. I jumped right into the Championship mode, eager to unlock some new courses and snowmobiles. There are three modes under Championship: Sprint, Snocross, and Freedom League. Sprint Mode is an open map race that utilizes giant orange slalom checkpoints that the player must maneuver. Thankfully, there is a mini-map on the bottom left that shows a topographical view of your next checkpoint. This open map was frustrating at first, as I often found myself having to follow the AIs to know to where I must go. The maps for Sprint Mode are expansive open world areas, but there are only three. The courses for each map are different areas set up with various checkpoints. I did not notice any real difficulty change in the courses from the early ‘beginners’ series and the later ‘advanced’ series. The Championship series feels like playlists. I never had to place in a qualifying race. There are no animations or voiceovers announcing I won. I just see a score screen and a medal achievement. The courses all play the same, as the AI has no difficulty settings. The AIs always take the same path and never hit trees, but are easily overtaken. All I needed to do to win was not crash into anything. I decided to up the stakes and take a peek at the multiplayer mode. The game just released, so I didn't expect there to be many players online, but I found a single game with five other players who were playing a random rotation of maps. Multiplayer, much like the rest of the features, is barebones. The online matchmaking mechanic lists servers on the left and details on the right, and has a quick match button. There is no way to filter the list. ...but the consistent lack of standard features bring this title down into the bargain bin. Features I would expect, like the ability to add favorites, searches for preferred game modes, server locations/regions or reported latencies, were all missing. Once you join a game and play a match, the online game brings you back to the menu after every race. As there are no in-game multiplayer menu options or details, I was required to reboot the online game with each new race — there is also no in-game voice chat, which helps maintain a family-friendly rating. I experienced a game freeze, on average, every four races. The race would launch and never load, and no connection details were given. Without any server information, there is no way of telling what might be causing the issue. The challenge of playing against other humans brought me a bit of the racing spirit. 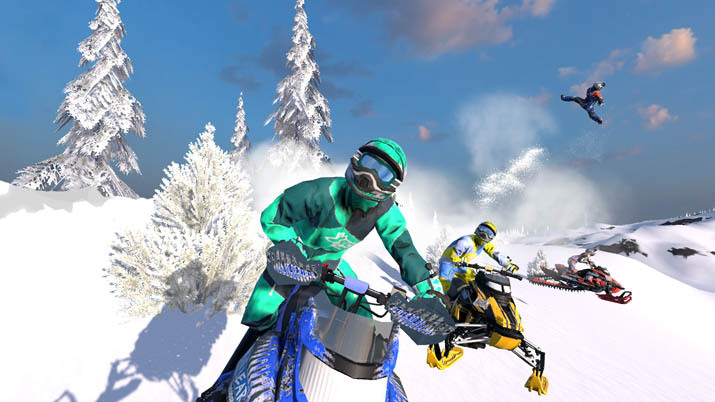 The short races interrupted by really long loading times and occasional server disconnects, however, made Snow Moto boring. The music is a dull, repetitive, single track, so I quickly muted it and played my own. Thankfully, the title was easy enough on my resources that I had no problem playing Youtube or Pandora in the background. Single Event offers up Time Trials, Stunt Mode, and Leisure mode. Time trials and stunt mode offer medals you can earn, and the global rankings are advertised proudly. I clicked on the rankings in the main menu, and all I was given was a single screen showing my overall rank and the top ten. I was not able to scroll or search. None of my statistics were being tracked, nor were any individual mode rankings. I couldn’t view or trade ghost riders. There seemed to be absolutely no effort at all placed on the global rankings. The leisure mode, however, is a nice feature: it allows you to free roam around the large open maps from the Sprint series. This would be even nicer if you could look around while on your snowmobile, but unfortunately, your vision is fixed straight ahead. The graphics are lacking, though, so the scenery wouldn’t take your breath away even if you could view it. 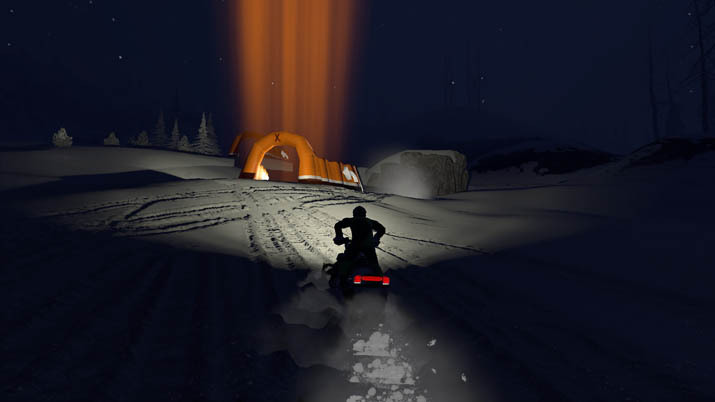 Snow Moto Racing Freedom disappoints visually and physically. The snow effects are lackluster, appearing more like blurry fog, and you can see the triangular 3D mesh used to make the ground as you drive by it. With the minimal features and low scale graphics, Snow Moto Racing Freedom plays more like an early-2000s arcade racer that you would expect to find at the mall or the back room of your local pizzeria. I am sure Unity has its limitations both regarding graphic quality and gameplay physics, but the consistent lack of standard features bring this title down into the bargain bin. This title would be perfect for children who are dipping their toes in racing games for the first time, but not for seasoned racing gamers. Final Verdict: SMRF (Snow Moto Racing For Kids). C. S. Cousins has been gaming since they were old enough to hold a controller. He picked up PC gaming at 10 after a family Christmas present of a Packard Bell 486. This marked a life-long love affair with DOOM and classic Point-and-Click adventure games. C. S. Cousins list Amanda Palmer, Kathleen Hanna, and Edward Snowden as personal heroes. Hobbies include: writing, playing guitar, pen and paper rpg games, Anime, Movies, Art, and anything else that stimulates the creative.